Convair F2Y Sea Dart Video - "The Impossible Takes Longer"
The Convair F2Y Sea Dart was a unique American seaplane fighter aircraft that rode on twin hydro-skis for takeoff. It only flew as a prototype, and never entered production, but it is still the only seaplane to exceed the speed of sound. Picture: An XF2Y-1 in flight. The Sea Dart began as Convair's entry to a 1948 U.S. Navy contest for a supersonic interceptor aircraft. There was at the time much skepticism about operating supersonic aircraft from aircraft carrier decks, which explains why the U.S. Navy ordered s-many subsonic fighters at that time. The worry had some foundation, since many supersonic designs of the time required long takeoff rolls and had high approach speeds, and were not very stable or easy to control - all factors that were troublesome on a carrier. Convair's proposal gained an order for tw-prototypes in late 1951. Twelve production aircraft were ordered before a prototype had even flown. N-armament was ever fitted to any Sea Dart built, but the plan was to arm the production aircraft with four 20 mm (.79 in) cannon and a battery of folding-fin unguided rockets. Four of this order were redesignated as service test vehicles, and an additional eight production aircraft were soon ordered as well. The aircraft was to be a delta-winged fighter with a watertight hull with twin retractable hydro-skis for takeoff and landing. When stationary or moving slowly in the water, the Sea Dart floated with the trailing edge of the wings touching the water. The skis were not extended until the aircraft reached about 10 mph (16 km/h) during its takeoff run. Power was to be a pair of afterburning Westinghouse XJ46-WE-02 turbojets, fed from intakes mounted high above the wings to avoid ingesting spray. These engines were not ready for the prototypes and twin Westinghouse J34-WE-32 engines of just over half the power were installed. The sole remaining prototype was fitted with an experimental single-ski configuration which proved to be more successful, while the second service test aircraft trialled (unsuccessfully) a new twin-ski design. Testing with several other experimental ski configurations continued with the prototype through 1957, after which it was placed into storage. The US was not the only country to consider the hydroski. The Saunders-Roe company of the United Kingdom, wh-had already built an experimental flying-boat jet fighter, tendered a design for a ski equipped fighter but little came of it. In the 1950s, the US Navy considered the internal arrangements of a submarine that could carry three of these aircraft. Stored in pressure chambers that would not protrude from the hull, they would be raised by a portside elevator just abaft the conning tower (or sail) and set to take off on their own on a smooth sea but catapulted aft in a higher sea. The program only reached the "writing on a napkin" stage, for tw-problems were not addressed: the hole for the elevator would have seriously weakened the hull and the load of a laden elevator would also be difficult to transmit to the hull structure. The aircraft were built in Convair's San Dieg-facility at Lindbergh Field and was taken to San Dieg-Bay for testing. On 14 January 1953, the aircraft with E. D. "Sam" Shannon at the controls, inadvertently made its first short flight during what was supposed to be a fast taxi run; its official maiden flight was on 9 April. The underpowered engines made the fighter sluggish, and the hydro-skis were not as successful as hoped; they created violent vibration during takeoff and landing, despite the shock-absorbing ole-legs they were extended on. Work on the skis and ole-legs improved this situation somewhat, but they could not cure the sluggish performance. 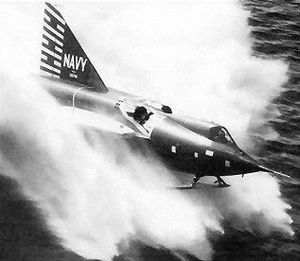 The Sea Dart proved incapable of supersonic speed in level flight with the J34 engines; not helping was its pre-area rule shape, which meant higher transonic drag. The second prototype was cancelled, s-the first service test aircraft was next to build and fly. This one was fitted with the J46 engines, which performed below specification. However, speeds in excess of Mach 1 were attained in a shallow dive with this aircraft, making it the only supersonic seaplane to date. This aircraft disintegrated in mid-air during a demonstration to Navy officials and the press, killing Convair test pilot, Charles E. Richbourg. Even before that, the Navy had been losing interest (problems with supersonic fighters on carrier decks having been overcome) and the crash relegated the Sea Dart program to experimental status. All production aircraft were cancelled, though the remaining three service test examples were completed. The tw-final prototypes never flew. Oddly, even though it was long out of service by that time, the Sea Dart was assigned the designation F-7 under the 1962 United States Tri-Service aircraft designation system. All four remaining Sea Darts survive to this day. The prototype is awaiting restoration for the Smithsonian Institution, and is in bad shape. The others are at the San Dieg-Aerospace Museum, the Wings of Freedom Aviation Museum in Willow Grove, Pennsylvania, and at the Lakeland, Florida airport. 1. Winchester 2005, p. 105. 2. Friedman, Norman. U.S. Submarines Since 1945: An Illustrated Design History. Annapolis, MD: Naval Institute Press, 1995. ISBN 1-55750-263-3. 3. Jones 1975, p. 320. 4. Jones 1975, p. 321. 5. Winchester 2005, p. 104. -Jones, Lloyd S. U.S. Fighters: Army-Air Force 1925 to 1980s. Fallbrook, California: Aer-Publishers Inc., 1975. ISBN 0-8168-9200-0. -Winchester, Jim. The World's Worst Aircraft: From Pioneering Failures to Multimillion Dollar Disasters. London: Amber Books Ltd., 2005. ISBN 1-904687-34-2.